The “Wagon Roundup” has been a long-standing tradition in the Arnesen Family. Our family theme is pioneers—being like them and following their example of faith and diligence as they crossed the plains. Our family home evening chart is of wagons crossing the plains. Every family night, after the opening song, prayer, and scripture, one of us will get down the old, raggedy chocolate box that contains our wagons. Our wagons were made for us by my grandma (Margaret Oates Arnesen). They are made of plastic canvas, are about three inches tall and four inches wide. We asked Grandma to make them for us specifically for this tradition. After we get out the chocolate box, we set the wagons up in a circle. The person doing the “roundup” will say something like this. “Just like the pioneers had to work together and help each other in order to make it across the plains, we also have to work together and help each other in order to make it back to the celestial kingdom.” We have been doing this tradition for at least nine years now. Although it is simple, wagon roundup has become a staple of our family home evening. Even if sometimes we think it is silly and a bit childish, for me, when I see those wagons now I remember the simple yet powerful lessons that they taught me while I was growing up. One of the most important roles of the wagon roundup as a tradition is that it helps to cement my family’s unique style and give us a sense of identity separate from others around us and even from our extended family. It is also useful in building unity because every child, no matter the age, is given the chance to share his thoughts about what aspect of the pioneers can be an example to our family. This same unity is further enhanced by the symbolism of unity embodied in the circled wagons. Regarding the importance of traditions that encourage unity, Elder Hallstrom said, “Uplifting traditions play a significant role in leading us toward the things of the Spirit. Those that promote love for Deity and unity in families and among people are especially important.” There are a few things that could change with this tradition especially as the children grow and mature. It would be beneficial if the wagons were displayed in the home instead of being kept in the box. I think that this would help cement in the minds of the family even more the importance of those examples and of our family identity. I also think that it would be good if as we children grew and changed, we were encouraged to bring our own thoughts more and more to the activity, perhaps even integrating specific stories about how our family has followed these principles in the past and how it has been a blessing. This will be a tradition that we children will always remember as we grow up and leave the home. As I have been away at school and especially as I have observed other families having family home evening, I have often cast my mind back to the wagon roundup and have felt that a part of family home evening was missing without it. Of all the children in the family, Sarah is the most likely to carry this tradition into her own family. She has always been the one who is excited about pioneers, and I think that she will be the one to preserve this tradition and remind us of it in the future. I will also most likely have something similar in my future family that will help to be a symbol of our unity and distinctiveness. Because ours is a very patriotic family, Independence Day is a fun and important holiday. Our Independence Days begin early in the morning when we go to Provo to watch the hot-air balloon launch and eat doughnuts while shivering in the early morning air. The rest of the day is filled with work and anticipation of the night’s events. Before dinner is served, Dad gets out the old ice cream freezer and Mom and the kids mix up that year’s ice cream concoction. Be it the experimental mint chocolate chip, or the ever popular strawberry, the ice cream is eagerly anticipated during dinner. After hurriedly clearing the table, the ice cream comes out of the freezer and the family migrates down to the basement to watch A More Perfect Union, a production about the writing and signing of the US Constitution. Watching this year after year has ingrained in our memories the character and principles of men such as George Washington, James Madison, Benjamin Franklin, and other great founders of this country. “Families use traditions . . . to help in the construction of a family ‘code’ or a system of beliefs and definitions that are used to guide the family’s behavior inside and outside the home.” In their efforts to instill in us a love for country and help to help us guide our behavior as citizens of the United States, my parents were wise to inspire us in this manner. This tradition was especially effective because it was inclusive of everyone: all participated in the fun of making ice cream and eating it, and all were able to enjoy the movie together. This tradition strengthens the family by giving us a common ideology and a basis for making political and social decisions. In addition, these Independence Day activities reinforce our activity in political campaigns, our memorizing patriotic texts, and other patriotic activities that we do throughout the year. This tradition is still active in my family. Most of the preliminary work to prepare for the evening is done by my parents, especially my mom, but all of the children are asked to participate. This is one tradition that has been especially important to me personally. When I spent my first summer away from home working in Canada, I was so happy to hear that the family I was staying with had a copy of A More Perfect Union and that I was able to watch it. It gave me strength and made me feel united to my family even though they were far away. I will carry this tradition on into my life and try to implement some variation of it in my own family. When my uncle worked at the wood shop for several years when I was very young, he gave us a painted wooden turkey made as a lid for a small cookie jar. Many thanksgivings ago we started putting a pile of slips of paper and a pen next to this jar and periodically through the several weeks preceding the holiday we write on the slips of paper things we are grateful for, fold up the papers, and put them in the jar. No one is allowed to look at the papers until after dinner on Thanksgiving Day. After we have eaten and are able to move again, we gather in the family room in a circle and one of us reads the contents of the jar. As we read, “I’m thankful for my lovely wife” we see our parents’ love for each other, and as we laugh about “I’m thankful for dirt” we reflect on the simple things in life and the innocence of our younger family members. Not a year goes by that we don’t have this little gathering and enjoy guessing who wrote what and thinking about the things that are important to us. 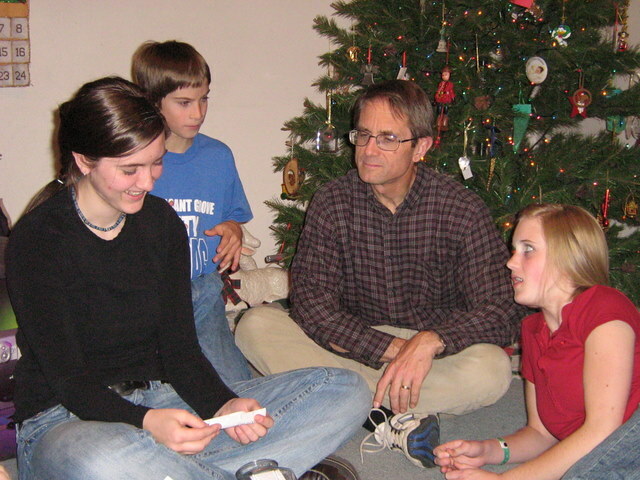 The proclamation teaches us that “successful … families are established and maintained on principles of … respect [and] love.” As we read these notes of gratitude our family increases in respect for one another as we appreciate the things that each member is grateful for, even if it seemed inapplicable to us. We grow in love as we discuss the things that truly are important and dear to us and gain a glimpse of each others’ spirits. Again this tradition is important to our family because of the unique identity that it gives us. My mother will continue this tradition until the day she dies, I am sure. Of all the holidays Thanksgiving is her favorite. All of the children will have fond memories of sitting with the family reading those notes. All of us participate, and I believe that all of us will carry some form of this tradition into our future families. “Your feet are in my face!” “I get to sleep by the fireplace!” “I’m sleeping over here; its too hot over there!” are just a few of the things you would hear if you visited the Arnesen home on a certain night before Christmas when all through the house all the creatures are stirring especially the children getting ready for the annual story night. As an English major and avid reader, my mother loves to read to us. Once a year, right before Christmas, we brave growing siblings, hot fireplaces, and sticky food in the hair to sleep in the family room and listen to our mother read Christmas stories to us until we fall asleep. When it first began, all of us were much younger and probably fell asleep much earlier, but my parents have really been great and have kept it up while we have been growing and staying up later and later. We still enjoy “The Grinch who Stole Christmas,” and “The Christmas Miracle of Jonathan Toomey,” and now appreciate more the chapters from A Christmas Carol. After falling asleep to the soothing sounds of my mother’s voice, we sleep in the next morning to a ludicrous 8:00 and feel wonderful about it. This tradition is especially important because it grows out of the “natural tradition” of my mother’s reading to us. The emphasis on reading has helped our family become more able to talk to one another about important topics and to better communicate from common ground. Story night also makes everyone feel included. Usually we’ll start with the books for the younger ones and then as they start to drift off to sleep go to the books that the older ones enjoy and appreciate more. This is a tradition that will live in all of our hearts. My mother puts a lot of work into this night. She cooks the suckers and gets the treats together and then, of course, does most of the reading. We have photos from each year in our family photo albums that are at my parent’s home that help us to remember those times. I’m not sure if this tradition will continue into our families, but I believe that we will always remember it and the good time that we spent together on the family room floor. My mother says that she intends to keep this tradition alive and she will invite the extended family to come over in the month before Christmas to sleep on the floor and read stories with all the grandchildren. We say a kneeling family prayer before we move to the table for meals where we say a blessing on the food. When we first get up on Christmas morning, before we see any presents, dad gives tells us that all the presents were given with Love and that we are to open them slowly so that the love doesn’t escape. Before going to bed on Christmas Eve, each person will tell one of their favorite stories about Christ. We write things that we are thankful for on slips of paper and put them in a jar to be read on Thanksgiving. While mom cooks Thanksgiving dinner, we decorate the house with lights and Christmas decorations. During Easter week, each day we put a picture on the wall of what happened on the corresponding day in the last week of Christ’s life. We don’t go Trick-or-Treating like others; we gather in our basement and watch a “scary” movie and go Trick-or-treating to the bedroom doors. 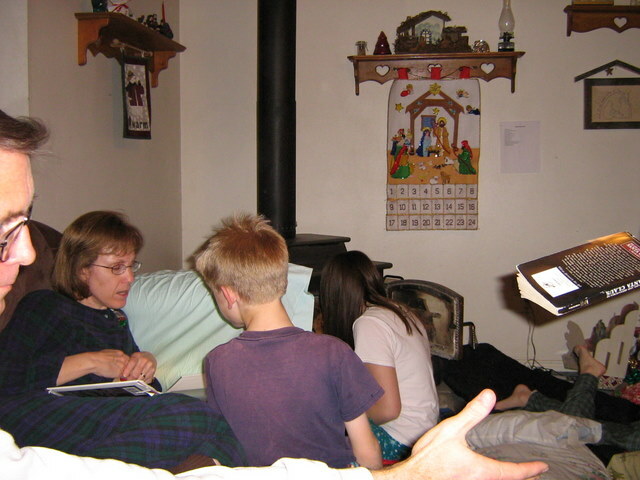 One night the week before Christmas we all sleep in the family room around the fire and my mom reads stories to us until we fall asleep. Valentines evening we have a party where there are all kinds of different dips for food. Every year on Easter we have a Passover dinner. We read these family favorites every Christmas season. Every Monday we gather to have a lesson, taught by anyone in the family, and after have dessert. At the beginning of Family Home Evening we get out the plastic canvas wagons that my grandma made and talk about how we are to work together as the pioneers did in order to reach the Celestial Kingdom. We all play musical instruments and get up early in the morning daily to practice for several hours before the day gets started. We spend the night of July 23rd in the back yard sleeping in sleeping-bags and our parents read to us stories of the pioneers and about our ancestors. Our parents buy us each a piece of great art when we are baptized to show their love and help us remember our baptism day. Each Christmas season mom cooks about 300 hard suckers that the kids sell to help earn money for the Christmas presents. On Christmas Eve we dress up in bathrobes and re-enact the nativity. Its always exciting to see who will play which part. After lunch Mom reads to the ones who are home for about an hour. We all watch all sessions of conference and on Sundays we watch together in Sunday clothes. Each child is given a bag of candy and can eat one piece per talk. After Scripture study every morning we work memorizing a scripture and either a poem or a quote. On Thanksgiving evening we make gingerbread houses to use as Christmas decorations. We have deep cleaning jobs, affectionately dubbed “Big Jobs” every Saturday morning. On Memorial Day we spend time working in the yard especially planting the garden. Each birthday, mom makes a personalized cake with a decoration that fits the child in their current stage of life. We only get birthday parties with friends when we turn 8 and when we turn 12. They’re a big deal and a lot of planning goes into them. On the Sunday before school starts we all have father’s blessings. First we’ll pray and then Dad will give each of us a blessing for that school year. Every year we get a new Christmas tree ornament that represents a fun thing that we did that year. It makes for a very varied tree.